Hi all, Pete here from Northside Auto with some information about brakes, and brake repair. We can all agree that functionally, brakes are probably the most important part of your vehicle. When we need the ability to stop, whether slowly or suddenly, we rely on our brakes for safety. Calipers – Calipers are large hydraulic clamps. Callipers have one or more pistons that move outward with the increased brake fluid pressure, forcing the brake pad to contact the rotor surface thereby slowing or stopping your vehicle. When you take your foot off the brake pedal it releases the pressure, the piston retracts pulling the brake pad off of the rotor surface. Calliper integrity is vital to the function of the brake system and can be compromised as a result of exposure to road grit, heat and contaminated brake fluid. Rotor Drums – Rotors drums are attached to the wheel of your vehicle. They are the surfaces that the brake pad and shoes are forced to slow or stop your vehicle. Brake rotors and drums must dissipate heat and stand up to continuous contact with water and road grit. When we talk about replacing brakes, this can often refer to brake pads. 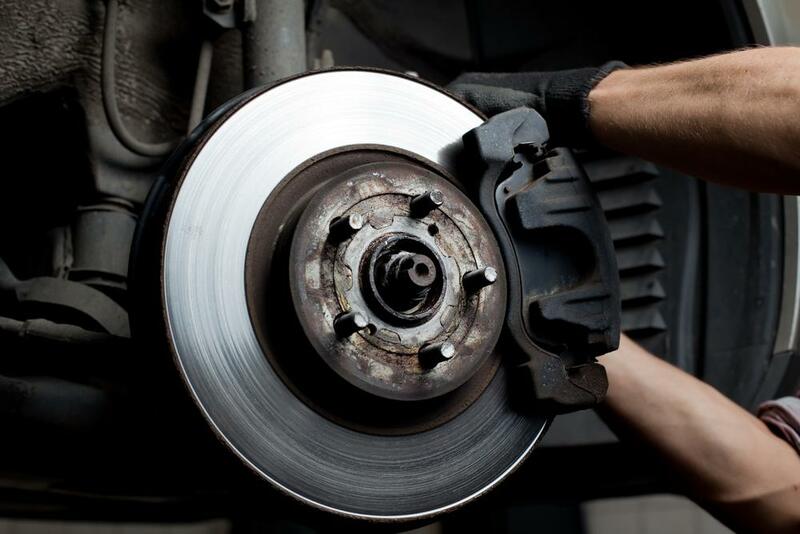 Replacing worn brake pads and shoes before they get to the metal-to-metal point, can save you money. When your brake pads get to the metal-to-metal point, it usually means expensive rotor and/or drum replacement. Machining your brakes refers to the resurfacing a rotor that is not worn down too far to be safely resurfaced or has cracks, deep grooves, severe rusting, hard spots or other structural defects. Machining or resurfacing can usually restore the friction surface on worn rotors to like-new condition. However when the rotor is worn down or has defects, this is when a replacement needs to take place. The minimum thickness of a rotor is set by the vehicle’s manufacturer and supported by the Department of Transport and Main Roads. The best way to ensure that you do not get to the stage of having to replace your disc brakes is to have your brakes checked regularly and have the pads changed whenever they start to wear. We are always happy to have a chat with you and discuss your brake repair and maintenance options. We are committed to providing you with advice which has your safety, and that of your passengers as a priority.